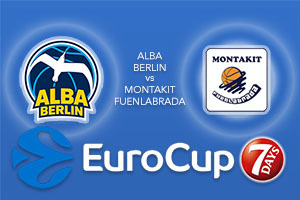 European basketball action is back in Berlin as ALBA welcome Spanish opponents. ALBA Berlin have caught the eye in European basketball in recent years and few will forget their exciting forays into the Euroleague in 2014/15. With a noisy crowd cheering them on, this is likely to be one of the most exciting basketball games of the week. The Germans were in Eurocup action last season and it was an up and down affair. A 4-1 record at the start of the regular season allowed them easy passage and they grabbed three big wins in the Last 32 to make it even further in the competition. However, this was where a showdown with German rivals Bayern Munich became too much for them. A draw in the home leg was followed up with a loss in Bavaria, and this game is the first step in ALBA Berlin seeking to go further in this years campaign, and they will fancy themselves to do so. This is the first time the Spanish side has been in the Eurocup since 2003 and they’ll be keen to leave their mark on the tournament as quickly as possible. While they have a number of players who will be keen to catch the eye, one player worth looking out for is Ludde Hakanson. At 20 years old, the player is a youngster but he comes from a great basketball pedigree. This is because Hakanson’s father and grandfather both played for the Swedish national team. He will be looking to add his name to the family hall of fame and if the away side are going to get anything from their time in Berlin, this is a player they will look towards. This has the makings of a tight game and the bookmakers aren’t splitting the teams by that much. You should look to take ALBA Berlin at -2.5, with odds of 1.90. Anyone looking for the Over/Under market for this game on Wednesday night should look to go UNDER 165.0 which is available at odds of 1.90. Bet Now!